jAlbum 16.1 has an interesting new folder linking behavior called "Mirror content". What "Mirror content" does is to create a folder tree mirroring the structure of the added folder, just like when you copy a folder to jAlbum, but the mirrored tree is filled with file links to the contents of the added folder instead of copies. This preserves disk space while allowing complete separation of jAlbum project files and your images. Historically, when link-adding folders, jAlbum has simply created folder links pointing to the added folders. Folder links preserve disk space and allows you to create new collections of folders in your albums without moving any physical files or folders. They also have the advantage of responding to changes in the target folders. The downside is that you may wander inside a linked folder and unknowingly be managing your original images which resides in a different location than the album project's tree of folders. File deletions made now affects real files, not copies or file links! Pay attention to the address bar above the thumbnails as it tells you what folder you're currently working in. If you feel folder links are scary for above reason, consider the new "Mirror content" choice! This will ensure that whatever you do thereafter within jAlbum only affects that album project. Try for instance to link-add your main image folder, hopefully containing a ton of images, then select "Mirror content" in the popup that shows. 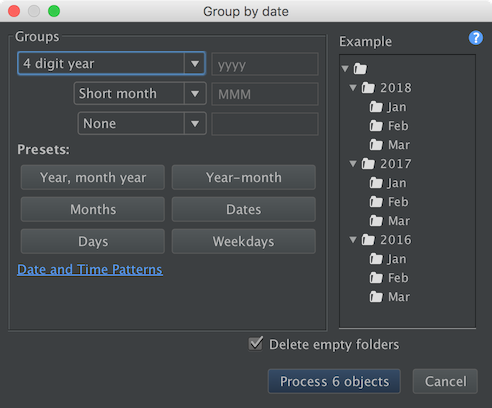 Now you can go wild with the mirrored tree and for instance use jAlbums Organizer to reorganize the tree of file links, for instance by year, followed by month or location. The only thing that gets reorganized are file links within that album project, (and jAlbum's metadata files are kept with your album project too). @scuba_fan, yes this is the obvious drawback. We'll see if it can be improved to pick up additions. It would mean a new type of folder then, and auto-synked folder of links. @philjphotos: Do you mean to put a small shopping cart next to each thumbnail, or in the lightbox? When you add images to the cart, the cart will pop up when you leave the lightbox mode. I believe it's a bit easier selecting images on the thumbnail page, and adding them with the "Add selected" button, which will instantly bring up the cart. I just didn't want to pop up the cart every time when users add a single image. Hi. Now using Tiger skin. which i like very much. My only criticism is the shopping car, when customers click on the small thumbnail to bring up a larger image the cart is at the bottom of the page where there is no information that people have to click on it to view prices. It would have been better to have put the cart on the right of the photo with a list of prices and sizes. @Mark, yes, I'm planning for it. An auto-sync, even if just an "update button", would be a worthwhile development, I think. @Mark, it's a one-off, but you can quickly update a folder by deleting and re-adding it. I'm considering to implement some kind of auto-synk in the future. OK, now I've re-read it, a question, please ..... does the "mirror content" respond to changes in the target folders, or is it a "one-off" event, a snap-shot? I've been asking for this since the day I met jAlbum.